Hero Quest is an adventure platformer. You play the Hero on their way to save the princess who has been captured by the Evil Wizard. With Lex, your helpful fairy guide, at your side you cannot fail! But is everything as it seems in the world of Hero Quest? 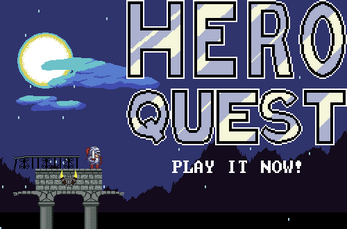 Hero Quest has 3 endings have you experienced all the game has to offer? Hm, now chose the normal path and the 100% anti path. I wonder how to get the 3th ending?